Hitting the streets of Hanoi, we knew we’d arrived at the beginning of the south-east Asia adventure we’d been looking for. There were scooters everywhere. There was street food everywhere. The currency was a funny name (hehe, ‘dong’), and converting back to the equivalent price in a more familiar denomination involved division by tens of thousands. Though you’d have to double-check that calculation frequently: especially when buying food at a stall on the footpath, you’d often think that surely you’d shifted a decimal place somewhere. ’Cause surely it couldn’t be that cheap. 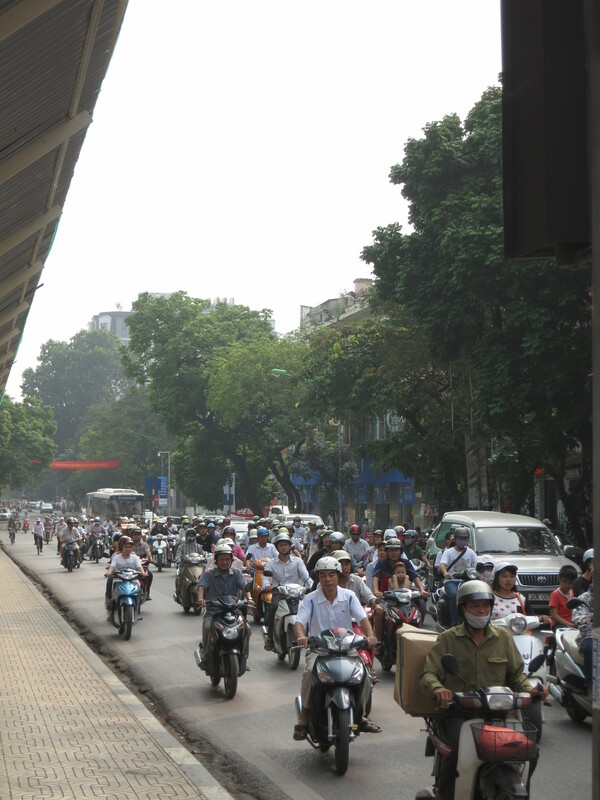 Traffic in Hanoi. There are a few scooters. And the museums that weren’t trying to indoctrinate us were often, well, bizarre. The second floor of the Ho Chi Minh Museum is, well, I don’t know how to describe it. 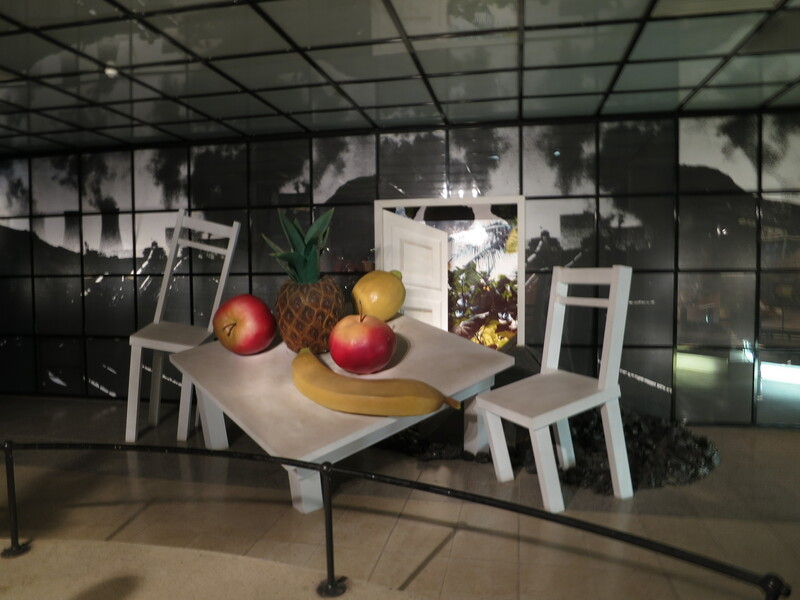 There are some attempts to represent important features of twentieth century thought and art. They’re, umm, interesting. I hadn’t really thought before that ‘culture’ could be used as a transitive verb, but we certainly came away feeling like we’d been cultured. But, all that said, the museums weren’t all bad. 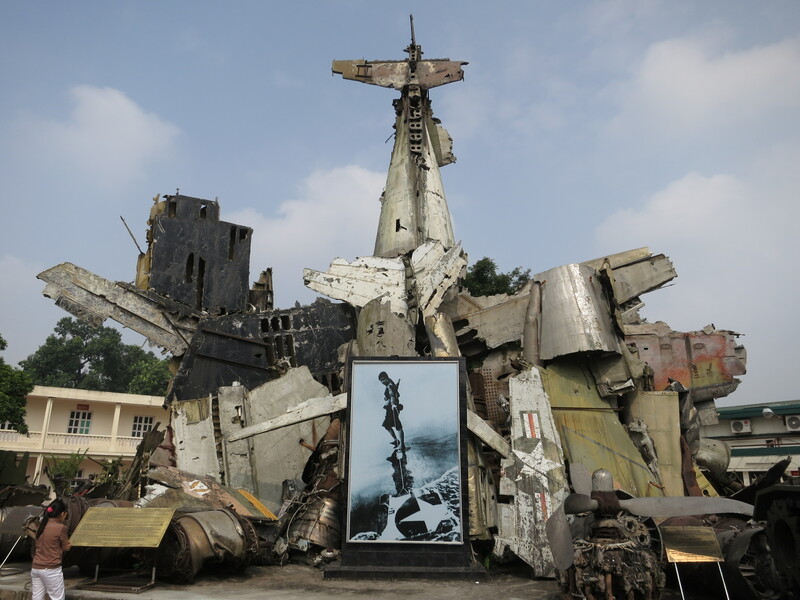 As long as you ignored the patriotic descriptions, the miscellaneous remains of US aircraft and ordnance in the Vietnam Military History Museum were definitely worth seeing. And not many other places will let you climb in and on an actual genuine Chinook. 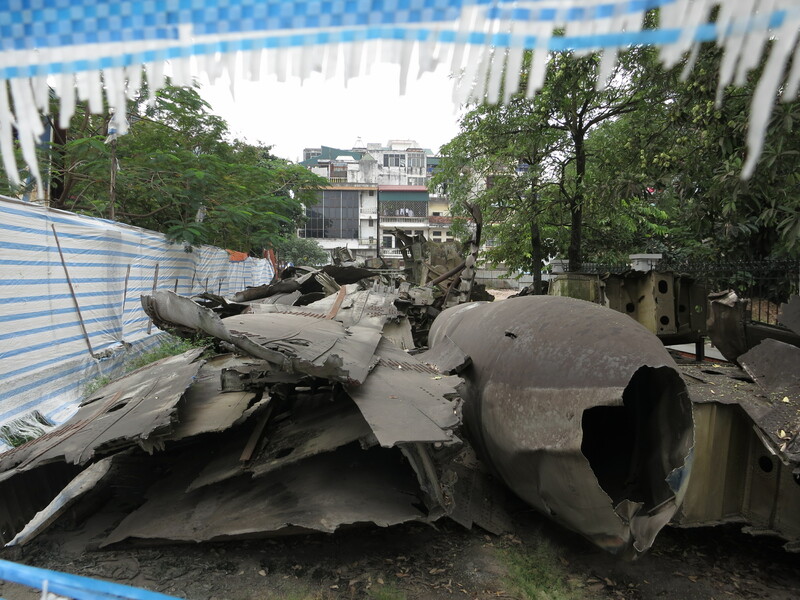 Beyond that, we did also get quite some entertainment seeking out the location of the remains of an old American B52, recently dredged from a lake in suburban Hanoi (where they’ve been poking out through the surface for the last forty years) to become the new centrepiece of an under-construction ‘B52 Victory Museum’. 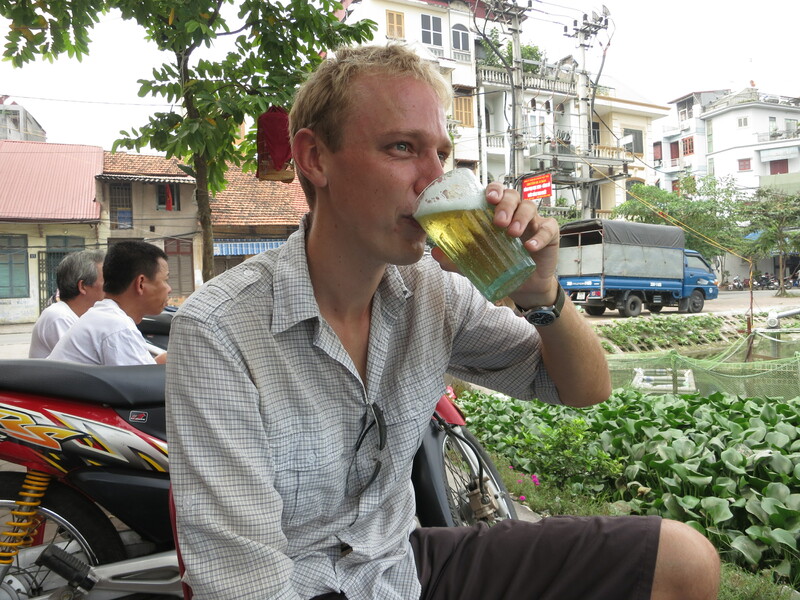 But, it has to be said: the real highlight of Hanoi was the beginning of my love affair with Vietnamese food, and with bia hoi, a preservative-free relatively light-alcohol beer brewed daily throughout Hanoi. Some of the dishes I could name and order appropriately. Some of them I couldn’t – I’d just point to a random item on a menu and see what turned up, or I’d point to something another patron was eating and ask for that. Some of the dishes, for all I know, don’t even have names: you’d just turn up to the street stall and get whatever one dish it was that that particular stall made. Because seriously, what’s not to love about wandering along the footpath, discovering a set of tiny plastic stools in your way, and sitting down to a hearty meal of stuff you don’t recognise described in a language you don’t understand, accompanied by slightly watery but incredibly refreshing beer? One thing I do know: I didn’t come across a dish I didn’t enjoy. And it wasn’t because I didn’t try enough different places, eat enough meals, or point to strange enough sounding things on the menu. Oh, and one final thing before leaving Hanoi. We didn’t discover this until the day before we left, but there’s a place called ‘Smoothies and Juices’ at 15a Hàng Tre, on the eastern side of the city. You’ll want to go there and try out the Cookies frappucino. Good work, ladies and gents, good work.